Fans have been waiting a very long time for a proper Power Rangers movie and (hopefully), it is just a couple of months away. That being the case, Lionsgate is starting to do some more promotion for the upcoming reboot. Because of that, we now have our first look at Bryan Cranston as the Power Rangers' mentor Zordon. This first look at the new Zordon comes from the fan site Power Rangers Now! and it may be a pretty rough look, but something is better than nothing. Lionsgate is getting ready to open up a Power Rangers VR experience in Las Vegas and the Power Rangers Now! team uploaded this very choppy cell phone image of Zordon as revealed in the VR experience. Honestly, it is hard to make a lot out of the image, but what we can see looks to be relatively faithful to the original Zordon, but at the same time very different. The image appears to be from the weird cave that was seen in the first trailer for Power Rangers. At the very end of that trailer, we see the new team getting in the suits for the first time and this appears to be in that same location, which would make sense. 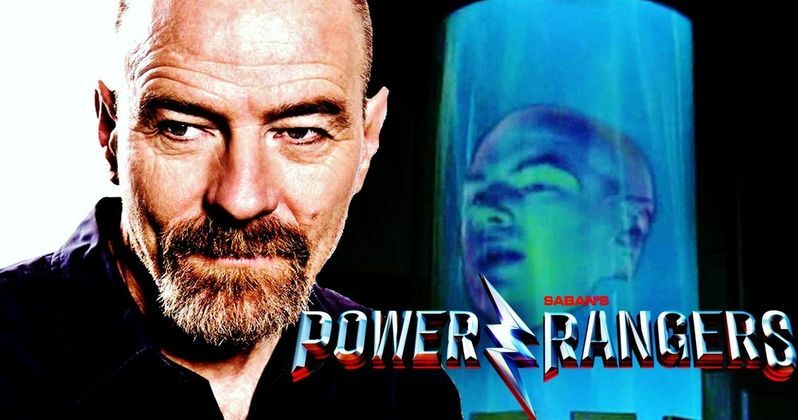 Bryan Cranston isn't just providing the voice for Zordon, he is truly playing the character. Shortly after it was announced he would be playing the role in the upcoming Power Rangers movie, he revealed that there is some motion capture involved, but there is also definitely going to be a good amount of CGI. Here is what he had to say about it in an interview with Entertainment Tonight. "Yes, it's motion capture and it's a lot of CGI-work. The tenant of that storyline is that this a real person who is trapped in this etherworld and it becomes this in-the-wall so to speak of [the command center], He still has a heart and mind, but an agenda that he's got to get these five Power Rangers to defend the earth or else everyone they know will be killed. So, it's exciting." Zordon is coming full-circle in a way in this new Power Rangers reboot. In the original Mighty Morphin Power Rangers series, Bryan Cranston actually did a fair amount of voice work for various characters on the series in the earlier stages of his career. In addition to Zordon, this new Power Rangers will also be bringing back familiar elements like the robot Alpha-5, who is being voiced by Bill Hader, as well as Zords. The first trailer made it clear that is is a very different version of Power Rangers, but Lionsgate is clearly staying true to many elements fans love from the original series. The Power Rangers themselves are being played by promising up-and-comers. Me and Earl and the Dying Girl's RJ Cyler is playing the Blue Ranger with Darce Montgomery as the Red Ranger, Naomi Scott as the Pink Ranger, Ludi Lin as the Black Ranger and Becky G as the Yellow Ranger. Power Rangers is being directed by Dean Israelite and is set for release on March 24, 2017. Be sure to check out the new image of Zordon for yourself below.